Gosh, a truly beautiful blanket - well done! Wow - great job! Love those socks. Hi welcome from South Africa - another newbie! Denise, thank you so much, I appreciate you sharing your experience and knowledge! My house is for sale...maybe you're interested? Beautiful home hope it sells soon! The initial fire started when a woodcutter's house burnt down. There is arson suspected but nothing confirmed as yet. The article below copied from FB by Herman Labuschagne for those interested Knysna has changed completely. The damage is worse than what I'd thought. That is quite remarkable, given how reports have a way of inflating the seriousness of events in general. This town that had been built close to the sea, around a lake, and encircled by hills, had been literally cut off and surrounded by fire on all sides. I think it is fair to say that several of the outlying suburbs were to a large extent burnt out altogether. As I speak the fire is still smoldering in the hills and in the bushes. Cars drive slowly and respectfully. A strange stillness reigns, and the bowl which holds the town remains blue with smoke. The interior of every building you enter carries the acrid smell of destruction. Wherever you go people are telling each other what they saw, what they experienced, how lucky they had been to have escaped - or how they had lost everything in a matter of minutes. One lady told me, "everybody - and I mean EVERYBODY knows somebody who has lost a home." People are speaking softly in Knysna. They don't smile a lot, but theirs is not the expression of defeat. It is merely the expression of determination to continue one day at a time. They seem grateful to be asked how they had fared. Nobody asks for anything. They're not even asking to be heard. They're just glad that you're there - spending a minute to hear a stranger. I took the wrong road, up the hills past Simola. The valley was mostly burnt out on both sides - from hovels to millionaire mansions. Some homes are gone so completely that it is difficult to make out where they had stood. I drove slowly and stopped here and there. People were lingering among the ashes of their dreams. They all looked like they were there to find something, but it was clear as daylight - this fire left nothing at all to be salvaged. Milling about aimlessly, not making eye-contact. Just staring at the ashes - or at the far horizon. One person showed me photographs that a friend had shown him. Two double storey wooden houses next to each other. One caught fire like a petrol rag and burn away in 15 minutes. Of both storeys full of furniture, absolutely nothing remained. Not even coals. The terrific wind blew even the ashes away until only the foundations remained. The house next door remained unblemished, except for the lawn on the driveway that got burnt. I saw the same thing everywhere. So unbelievably little remained of what had been big houses. They were reduced to molecules, and then blown away from the surface of the earth. Another thing I noticed is very curious. The houses seemed to have burned at random, even right into the CBD. Some had escaped miraculously. In a whole street of burnt-out homes, one would stand untouched. It is unbelievably how every possibly thing around them had been incinerated - yet there - wonder above wonders, still stood a house - fire-blackened and blistered, but its roof and contents entirely unharmed. I saw even wooden shacks that were built right inside the forest - everything burnt to charcoal around them, but the cottage stands untouched. I cannot explain it. I can only marvel. The whole town is crawling with firemen. Someone had put up a refreshment stand for them opposite the municipal building. There they they sat, bleary-eyed and puffy-faced, and drank Coke and ate a few snacks, before quietly moving back towards the battle front again. Fire vehicles with registrations from as far away as Mpumalanga. The heroes of our country, doing what they could to save the world in miniature. Elsewhere there is frenetic activity in all directions. Hordes of municipal workers are already cleaning up, even though the fires are still burning. Men with blowers, clearing the streets, gutters and pavements of debris. Workmen with brooms, sweeping rubbish off the sides of the road between Knysna and Sedgefield. Telephone technicians and electricians, huddled around transmission boxes, and big six wheel drive trucks delivering transmission poles to replace the burnt out power infrastructure. It is incredible to think that it is hardly 48 hours after the fire had swept through. The town shops were open. There were specials on. There was life in the streets, but people still spoke gently and acted with a new sense of kindness. This had been a very strange disaster. I noticed that nobody looked scared. Nobody looked angry. Nobody looked traumatized. Not once did I hear, "why me, Lord...?" The mainstream media had reported little that was useful. Instead, social media reported most of what really mattered. Upon own inspection, I discovered that much to my surprise, the news that had been conveyed in this manner had largely been accurate. 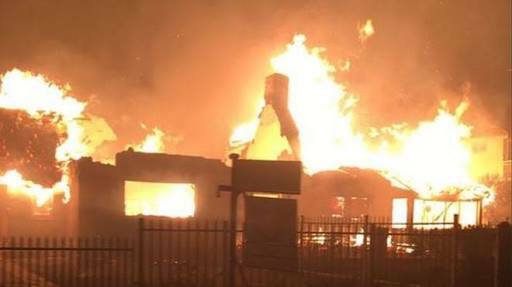 The only notable mistake that I could spot was that as far as I know the district hospital had been evacuated but had not burnt down - although I think it had been a close call. I didn't have time to look around, and didn't feel in the mood for photo journalism at all. If I had, I could have spent a lot more time photographing the disaster scene. But one doesn't feel that way when walking upon the debris of broken lives. You do what you can while you are there, and when you go home again, you take a lot of what you had seen with you. Today was a sad day, but also an inspiring one. I have seen something of my ancestors today. That sense of fatalistic acceptance of disaster, and the same kind of dogged determination to prevail, whatever the cost. I was glad to see what we still have it. Or at least some of it, even though we are a spoilt and materialistic generation. For all our many faults, therefore, it was a pleasing discovery to see that the citizens of Knysna have taken disaster so admirably well. Among all the spineless character that dominates our present age, and all the selfishness and traiterous deceit, there still seems an element that I would not call pride, but rather dignity. I know, because I saw it. As I drove out of town, my eye was drawn by an unexpected sight. There, all alone by the lakeside, stood a lonely fisherman just as if the world had never gone up in flames. I nodded to myself when I saw it. When the waters of our minds become a storm, a fisherman will take his rod and sit by tranquil waters. After Jesus had been crucified and it looked as if the hope of the whole world had been lost, His disciples had a variety of options. They chose to go fishing. No doubt in order to console themselves and rest their aching nerves. A fisherman is a man who is drawn by hope. He is drawn by better expectations. He is there because he believes that one way or another, something better might heading his way today. And if not today, then surely it must be tomorrow, or some day soon thereafter. 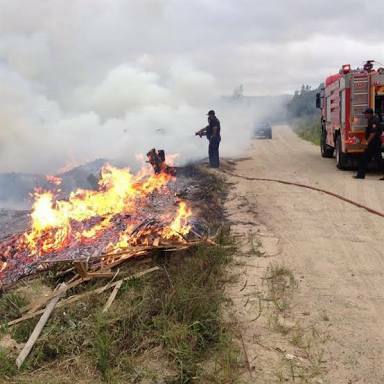 Fire has touched the heart of Knysna. And when the dross had been burned away, it left behind a shiny bead of gold. A lot of people's lives lie in ashes, we're truly grateful and amazed at the generosity of so many from as far away as New Zealand who are helping with mop up operations -wow! Our church is offering trauma counseling, it's interesting that a catastrophe such as this brings back memories for those not necessarily directly affected and they now also experiencing a difficult time. We now desperately need rain. Brilliant - love them !